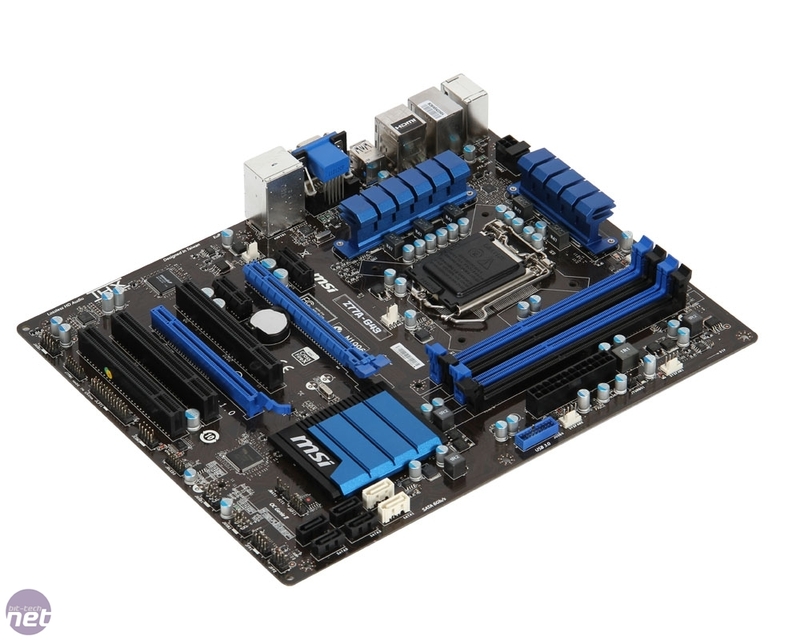 At only £76, the MSI Z77A-G43 is cheap, very cheap. This fact is especially apparent when you consider that the Z77 Southbridge on which the board is based is Intel’s premium chipset for what is arguably its most successful socket of recent times, LGA1155. Getting access to this socket, the beastly CPUs that go along with it, and all the goodies that Z77 brings to the table - such as native USB 3 and PCI-E 3 support - for substantially less than £100 sounds like a no brainer then, right? Well, as ever, things are a little more complicated than they initially appear. For a start the specification of the board is significantly cut down from that of the circa £150 boards that we’ve looked at up to this point. You would expect this though, given the price of the board, and we actually think MSI has made some pretty smart choices in this department. It’s dropped SLI certification for instance (though Crossfire X accreditation remains), which isn’t a massive loss, and it’s worth nothing that while there are two 16x PCI-E slots on the board, only the top one is PCI-E 3; the lower one runs a measly 4 PCI-E 2 lanes. 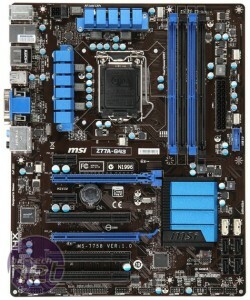 MSI has also done without adding an extra SATA 6Gbps controller to the board too. What does this mean in practice? Well, not a lot really - few people are likely to need more than two SATA 6Gbps ports, given that only SSDs can make proper use of them, though you do also sacrifice the eSATA port that a third party controller would usually be used for. Of more concern is the mounting of the SATA ports, as they are mounted in the old fashioned, perpendicular manner, which leads to less tidy cabling. The layout of the board is relatively standard, though it’s obviously without the bells and whistles of the more expensive boards - there are no onboard power and reset switches for example. 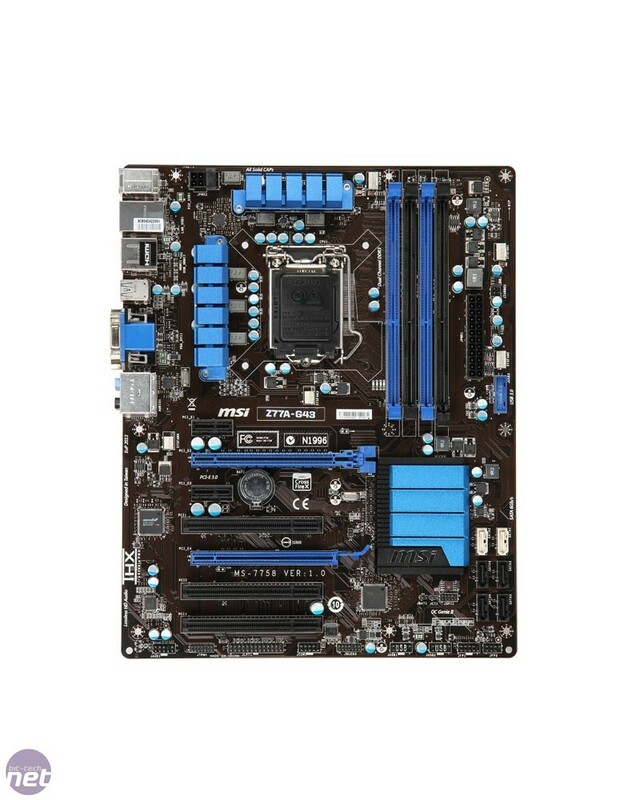 Everything that is present is laid out sensibly however, with the main power sockets at the edges of the board, and the RAM slots a good distance from the CPU socket. Clustered around the CPU socket is the VRM circuitry, which looks noticeably slimmed down compared to other boards we’ve seen. This isn’t an instant concern - we’ve seen budget boards with basic VRM circuitry overclock like champions before - but it could affect the longevity of the board if you overclock it heavily. Having said that, this isn’t likely to be a concern, as MSI has crippled the EFI of the G43 to such levels that you’re unlikely to be able to coax a major overclock out of the board. The measly 0.06V that you’re able to add to the Vcore is very low, and meant that we could only overclock our test CPU to 4.4GHz, rather than the 4.8GHz we’ve been able to hit with every other Z77 board. This is a frustrating state of affairs, as up until this point we were fairly impressed with the G43. We’ve got other Z77 MSI boards in the labs that can add plenty of extra voltage too, which indicates that higher Vcore voltages are something that MSI has purposely chosen to leave out. This is a troubling thought as it could indicate the start of a trend, with motherboard manufacturers purposely limiting their low end boards to ensure you have to buy a premium board to overclock with. It’s essentially the same tactic as Intel has employed with its K series CPUs, forcing users to trade up if they wish to overclock. We can’t say we blame it - as a business MSI would prefer consumers to buy its premium rather than entry level products - but we can’t help feeling that it’s a tactic that is completely at odds with the overclocking spirit.